Researchers have been able to revive a fungus found in ancient deep-sea sediments drilled from the Indian Ocean’s Chagos Trench (5,904 m below the sea surface). They think the microbes were blown off the land and sank to the sea floor between 180,000 and 430,000 years ago. The finding adds to ‘growing evidence’ for the impressive survival capabilities of micro-organisms: similar dates have been obtained for fungi revived from ice; living bacteria have been found in bees trapped in amber dated at up to 40 million years old, and dormant bacteria have been found in salt crystals dated at 250 million years—although that claim ‘was disputed almost as soon as it was made’. BBC News, <news.bbc.co.uk/1/hi/sci/tech/3754090.stm>, 18 November 2004. No wonder these claims are disputed—by evolutionists themselves—as DNA would have long ago fallen apart and degraded if these time periods were true (see Salty saga, Creation 23(4):15, 2001). But in a world only around 6,000 years old, accounts of microbes being ‘revived’ are understandable. An aerodynamic analysis of fossil pterosaur wings shows that pterosaurs were capable of complex flight, so were not merely ‘primitive’ gliders as often portrayed. With a complex wing anatomy which included a fine network of muscles and sensory nerves (Creation 26(2):9, 2004), pterosaurs were able to change wing shape during flight to control speed and exploit flight conditions. Aerodynamics experts hope to model future aircraft design on the pterosaur wing. Modern fixed-wing aircraft change the shape of their wings, using flaps and extensions, only during take-off and landing. In contrast, the ‘convertible’ wings of pterosaurs and birds give a much smoother ride in turbulence, as well as saving energy and achieving better performance. And a fossil trackway left by a pterosaur shows they were not only good flyers, but masters at landing as well. The fossil footprints show the pterosaur slowed its flight to touch down lightly on its hind feet, dragged its toes, then made a short hop. It then put down its front legs to walk on all fours. New Scientist, 13 November 2004, p. 17. News in Science, <www.abc.net.au/science/news/tech/InnovationRepublish_1069737.htm>, 26 March 2004. Note the clear evidence of design (implying a Designer—Romans 1:20). Design engineers have been drawing on animals for inspiration for years, as we have documented in Creation many times. Note, too, pterosaurs were eminently aerodynamically suited to the present atmosphere—so there is no need to invoke theories of higher atmospheric pressures in the past. The fact that we have such incredibly detailed fossils from which to glean such information is yet more evidence of rapid burial in the global Flood of Noah’s day—see also the amazing pterosaur egg fossil on p. 35 and the arthropod caught in the act of moulting on p. 45 [images available only in magazine]. Archaeologists digging at an ancient Roman temple precinct have found a small tin canister, dated to the middle of the 2nd century ad, containing a whitish medicinal or cosmetic cream. Chemical analysis reveals a remarkable degree of refinement in the technology needed to produce it. Its ingredients are strikingly similar to those in modern cosmetic creams—researchers suggest fashionable Roman women desiring a fair complexion used the cream as a foundation layer. Meanwhile, researchers have finally worked out the formula for ‘Pompeian red’—the stunningly shiny and intense colour used by the ancient Romans in Pompeii’s wall paintings 2,000 years ago. While Pompeian red consists of simple cinnabar (mercuric sulfide) pigment, it is unique—as one researcher said, ‘It certainly stands out when compared to normal cinnabar paint layers.’ The secret to Pompeian red’s vibrancy lay in the way that the natural cinnabar was processed, i.e. with ‘purification, grinding and dimensional control’—the final result being a meticulously prepared mixture of shiny 10–15-micron crystals acting as shiny particles in a matrix of finer (2–3-micron) grains. Nature, 4 November 2004, pp. 35–36. Discovery Channel, <dsc.discovery.com/news/briefs/20041101/pompeiired.html>, 18 November 2004. Contrary to what evolutionary theory teaches, man has always been intelligent. A popular idea is that a post-asteroid impact ‘nuclear winter’—caused by dust from the impact blocking sunlight—killed off the dinosaurs 65 million years ago. This is under challenge—from the honeybee. Paleontologists say that tropical honeybees preserved in amber before dinosaurs became extinct are ‘almost identical’ to their modern relatives. If no modern tropical honeybee could have survived the years-long period of darkness and frigid temperatures without the flowering plants they lived off, then something’s wrong with the nuclear winter theory. Astrobiology Magazine, <www.astrobio.net/news/article1289.html>, 18 November 2004. The evolutionary assumptions that rock layers, fossils and radioactive dating reflect a millions-of-years timeframe are inevitably going to encounter contrary evidence. From a biblical perspective, if dinosaurs are extinct, then they have only died out since the animals came off the Ark, i.e. 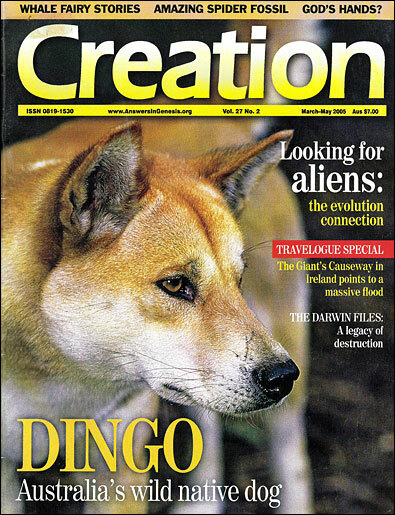 within the last few thousand years, consistent with finds of blood cells in dino bones (Creation19(4):42–43, 1997). Amber fossils are probably a legacy of the Flood (Creation 25(2):53, 2003). Four lifeguards were on a training swim about 100 m (330 ft) off Ocean Beach, New Zealand, when a nearby pod of dolphins suddenly raced in and circled closely around them. When one of the swimmers tried to move away from the group, two of the bigger dolphins herded him back—and then he saw why. A great white shark was heading towards the group, cruising about two metres (7 ft) below the surface. He said it was then he realized that the dolphins had moved in to protect the lifeguards from the three-metre (10-ft) shark. The dolphins maintained their protective cordon for 40 minutes—until the people made it safely back to the beach. Auckland University marine mammal expert Rochelle Constantine commented that the altruistic response of the dolphins was normal. ‘They like to help the helpless’, she said. ABC News Online, <www.abc.net.au/news/newsitems/200411/s1249440.htm>, 23 November 2004. Such altruism makes little sense if evolution were true—which is why evolutionists struggle to explain altruistic behaviour, even between members of the same species (e.g. Polar mums defy theory, Creation 23(1):5, 2000). But from a biblical perspective, even in a cursed and fallen world, man’s lifeblood is precious in God’s sight (Genesis 9:5), so little wonder that animal behaviour doesn’t match evolutionary expectations (2 Kings 2:24, Ezekiel 34:28, Daniel 6:22, Mark 1:13). It’s important to note though, that in this fallen world, the dolphin is not always the ‘noble and gentle’ animal that New Age believers like to portray, having been observed performing brutal acts even against its own kind (Creation 18(1):7, 1995). Dutch authorities are drawing up guidelines to allow doctors to euthanase children under 12 years of age, even newborns, if they have an incurable illness or ‘unbearable suffering’. Euthanasia is already legal for 12- to 15-year-olds, subject to parental approval. Bioedge 134, <www.australasianbioethics.org/Newsletters/134-2004-09-10.html>, 7 December 2004. While monkeys can learn to comprehend single words, or simple pairings of words, the key principle common to all human languages is beyond them, research has shown. A crucial component of the power of language is ‘phrase structure grammar’. (An example would be a sentence using the words ‘if’ and ‘then’—the words are dependent on each other even when separated.) This allows us to communicate opinions, complex social ideas and many other concepts that unstructured strings of words cannot. The discovery that monkeys lack this key ability has dashed some scientists’ hopes that they could be trained to master complex language. Science, 16 January 2004, pp. 318–320, 377–380. Prions, the infectious agents responsible for Mad Cow Disease, are also known for causing similar degenerative diseases in other animals and people. Smaller than a virus, a prion is believed to be a protein that is folded in a particular way so as to become a deadly pathogen. Yet a recent study of prions in yeast, published in a leading medical journal, reveals that they may sometimes have a useful function. It seems that prions increase the genetic variety in yeast, allowing them to adapt more easily to new environments. Lancet, 23 October 2004, pp. 1471–1472. Starting from the Bible, we know that God originally created everything very good, but that death and suffering entered the world as a result of man's rebellion. Therefore, it is not surprising to find that even agents usually thought of as pathogens have useful functions, since they were once non-pathogenic and part of a very good creation. Astronomers have tended to assume that there is nothing special about our place in the cosmos, especially during the last decade, when over 100 extrasolar planets have been discovered. [NB—None has yet been observed; but they have been detected from the wobble that they induce in their own sun’s motion and when they block out some of the star’s light as they move in front. (Editor’s note: for an update since the publication of this issue, please see First light from extrasolar planets.)] So, many believe that habitable planets like ours might be common. But a recent study suggests we could be alone in the universe after all. Martin Beer of the University of Leicester, UK, and co-workers say that the alien planets discovered so far could have been formed by a completely different process from the one that formed Earth. If that is so, says Beer, ‘there won’t necessarily be lots of other Earths up there’. There is at least one colossal difference between Earth and other planets—Earth was formed to be inhabited (Isaiah 45:18). The vastly lower number of genes means that the human genome is a lot more complicated than previously thought. And how could only around 35,000 genes direct the production of the hundreds of thousands of components that together make up the human body? And now, the International Human Genome Sequencing Consortium has further revised the estimated number of genes downward to fewer than 25,000. As one researcher put it, the paucity of genes in humans continues to ‘blow our socks off’—it seems like an awfully short list to account for the biological properties of a human being, he said. Nature, 21 October 2004, pp. 915–916, 927–945. The Scientist, <www.biomedcentral.com/news/20041021/01>, 22 October 2004.